Dogs require a lot of love, attention as well as care and to make it easier for you, its very important that you reduce the hassles of having one and use more time in loving them. Showering a dog is a frequent challenge in every home as your dog hates shower like every other dog. 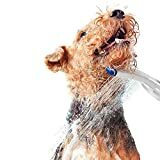 So it is extremely vital that you choose the right shower head to bathe your dog that will deep clean them and also make them feel good after each shower. The dog showers are designed in a different way so that the water can penetrate their thick coat of furs and provide deep cleaning of their skin while eliminating chances of making them uncomfortable and anxious. 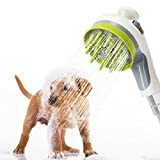 This article contains the best dog showers available in the market that has all the features for making the shower sessions impressive and loving for you and your dog. Have a look at it and decide for yourself which one you want for your dog. 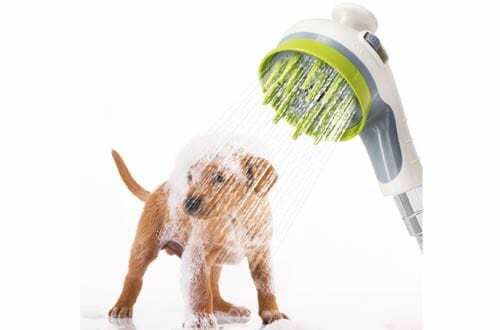 Give your dog the extra bit of tenderness and care with this amazingly designed dog shower from Waterpik. The shower is constructed out of professional grade materials and crafted with a contoured shape design that is suited to deliver a fine shower for dogs of all sizes. It also has a water comb spray that enables maximum cleaning power and allows the water to penetrate those thick furs with ease. Even for the sensitive areas, the gentle narrow spray works well. Use it with ease in both indoors and outdoors as the adapters are made to fit in multiple types of shower heads. Your dog deserves that extreme attention and care from your end and when you use the Rinse Ace pet shower, your dog will not run away from shower sessions anymore. 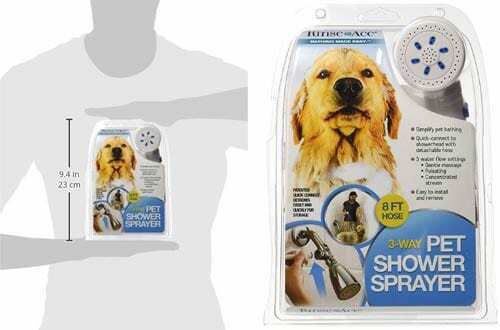 The 3-way design is convenient and promises to deliver a unique shower experience for your friend with paws. It comes with a gentle full spray mode that provides good cleaning even to the hard-to-reach points. The pulsating massage spray mode makes your dog feel good and joyful and when you need more, the concentrated spray mode handles the delicate areas amazingly. Even the shower can be adjusted from no flow to light flow to full flow as per your need. If you are looking for a shower that has a multipurpose use for both your dog and yourself, the Regee is a perfect choice for any family. The long, flexible and durable hose promise to serve you for a very long time as the corrosion free construction can work well in any bathroom. Furthermore, it comes with a sprayer head that can be connected even to warm and mix waters in the colder seasons. The perfect indoor hygiene solution made out of top-notch materials ensuring no leakage and spills while washing. 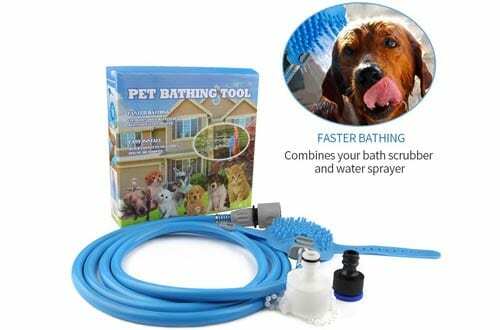 It also fits a long 2.4-meter hose allowing more flexibility of usage while bathing your dog. Aquapaw has designed this dog shower keeping in mind the hassles that owners go through while bathing their mischief furry friends. 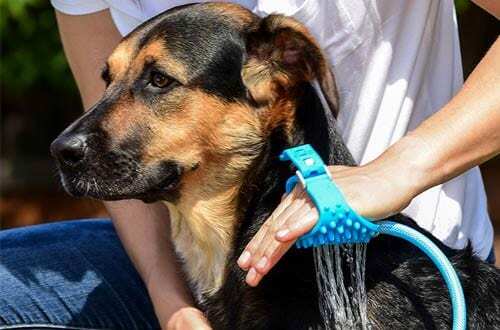 The one size fits all design as the adjustable strap can work on both hands and as it is slim as well as flexible, you can give your dog a massage while the water from the shower head seeps through the furs. Besides, the innovation in the design eradicates spraying techniques thus making it easier to use and reduces water wastage caused by unnecessary spraying. It also comes with all types of adaptor that fits different types of nozzles both indoors and outdoors. Deep cleaning experience and constructed of the most durable type of materials, the Lead Rise shower for a dog is made to last as it is made out of ABS and combined with chrome coating ensuring no rusting or corrosion from water. 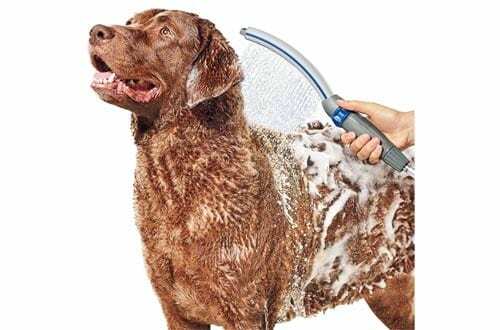 It comes with a long 150 cm hose for more convenient use and different modes to make your dog feel great while bathing. 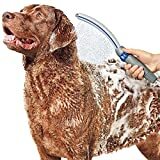 The bath tool ensures those thick furs are completely penetrated and deep cleaning is provided and the massage application makes it more enjoyable for your dog. It comes with water saving shower heads, brush on-off switch and different types of water outputs. 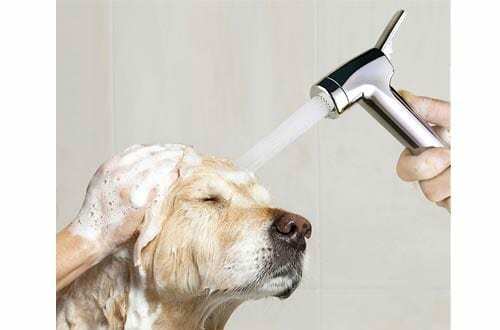 The professional touch at the comfort of your home, Onson’s Pet bathing tools pack an innovative design combined with a contoured shape shower head that is meant to reward your dog with a shower experience he will love. The shape ensures dogs of all shape and sizes can take benefits from it as the head combines both massage and shower simultaneously. Furthermore, it can be used by both hands and the adjustable strap makes it even more comfortable application. 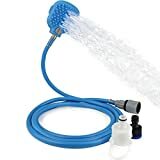 The 8 feet long hose adds to the convenience of usage and the smart design with a variable rate of water flow calms your dog in the most amazing way. 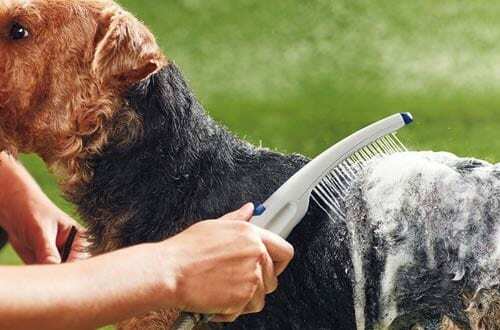 Bathing your dog will never be a challenge anymore as the PES 142 shower from Waterpik comes with a full coverage water comb spray for optimum results and total cleaning. It ensures the water penetrates the thickest furs with ease and can be used for both indoors and outdoors. Moreover, the 8 feet long hose reaches almost all places without any issue. It has all the attractive features to benefit your dog in every way and even comes with the one-handed operation for improving your convenience while you plan to struggle with your pet. 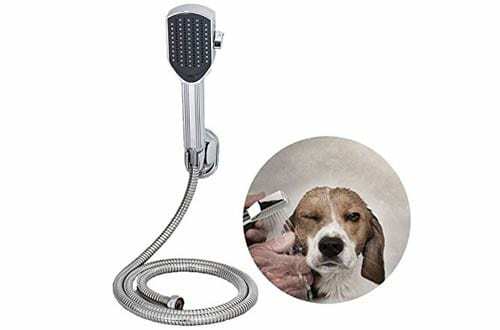 Though it is labelled as a pet shower, the shower head can also be used for cleaning body and hairs of any dog without any issue. It is smart in design and easily connects with the shower heads at your home without any extra need of plumbing. Besides, the flow of water and pressure can be adjusted as per convenience so that your pet does not feel uncomfortable while bathing. It can also be used in three different modes where water can come out separately from the shower head or hand shower and both together as well. Certainly a super efficient and reliable model for best results. At the top of the list comes the smart and intelligent Befrac Pet shower designed to deliver an amazing bathing experience for your furry friends. It has a 2-in-1 application where the water penetrates through their thick furs and even massages your dog for improved blood circulation as well as skin quality. The design ensures less water wastage and shampoo consumption plus comes with premium PVC hood to reduce spillage. 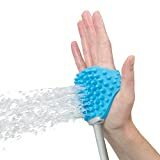 Furthermore, it has an easy grip and one hand operation making it more flexible to use with a smooth on-off button for easier use. 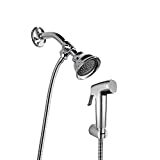 Connect it quickly as it has a universal fit shower head that fits most household nozzles. 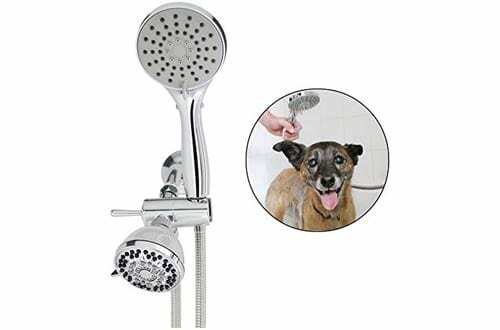 So next time you are planning to get a shower head for your pet, make sure you choose the right product that will provide you with a surety of comfort and convenience. These dog showers are well reviewed and have gained the trust of consumers over time as they are highly workable and efficient in providing you with impressive results.